close to Saint Chinian, means 10 minutes. 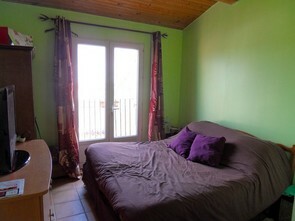 with a large garage and a nice courtyard of 70 sq m.
Béziers Cap d'Agde airport is also at only 48 minutes drive. bathroom with a bathtube and a shower, a toilet. Utility room and a shower room with a toilet which needs to be finished. Nota Bene: previously it was a « Vigneronne ». The works were done in 2006. Courtyard is south facing, with a barbecue, a green area well planted. Lots of charm. Now the pool has been replaced by a terracce. Living space about 105 sq m.
3 bedroom villa with 2 garages on 1 500 sq m of land. 3 bedrooms, bathroom, a toilet. on the hills, the land has a second acces. The house needs some works. Possibility to create a swimming pool. 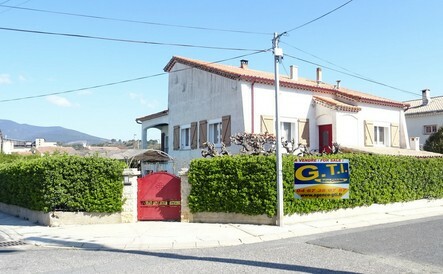 Living space about 104 sq m.
Cébazan is a pleasant village in Languedoc at only 25 minutes away from Beziers. You will find a baker, post office, bus line, school. And only 8 minutes away from Saint chinian and all its facilities. We offer you a 3 bedroom villa single storey with a garage on 680 sq m of land. and also an italian shower, toilet with a hand basin, utility room and a small bureau. manual and electric shutters, solar water heater. Quiet location and nice view. Living space about 115 sq m.
with an attached constructible land of 495 sq m.
Carcassonne airport and 1 hour and 10 minutes away from Montpellier. Ground floor : garage about 63 sq m with an utility room giving acces to the land. a toilet and another loggia with a nice open view. units system, gaz-fired central heating. Facade is South and North facing. on 406 sq m of land. Single storey. All guaranties available for new house. 3 bedrooms with cupboards, a shower room with an italian shower, a toilet. electric shutters. The villa will be finished for sept/oct 2018. Living space about 104 sq. 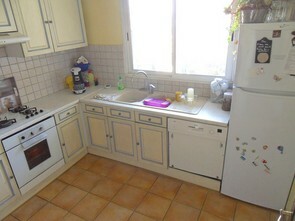 PRICE: 233 000 Euros (agency commission included). on the wine yards and St Chinian, on 457 sq m of land. 3 bedrooms including 1 ensuite with a shower and a bathtube, a separate toilet. electric gate. Living space about 86 sq m.
villa on 4 000 sq m of land. Single storey. water reserve/tank, large vegetable garden, wine cave. Various trees. 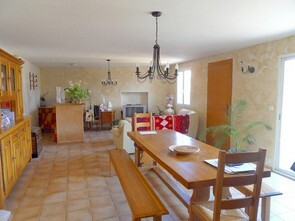 Living space about 100 sq m.
on 614 sq m² of land close to the center with swimming pool and garage. a toilet. Actually rented. Living space 65 sq m.
bathrrom with an angle bath and an italian shower, toilet. Living space 121 sq m. This apartlent is not rented. heaters downstairs, garage 27 sq m, workshop/boiler room, summer kitchen. Living space about 185 sq m.